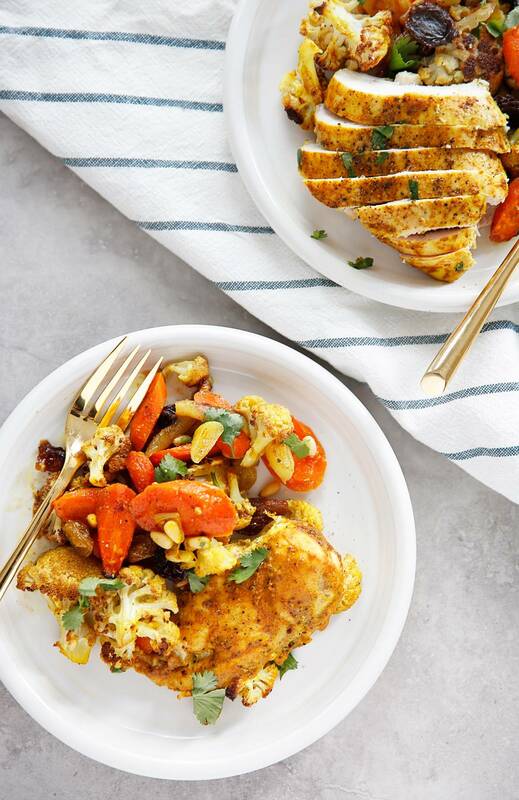 This Sheet Pan Curry Chicken and Vegetables is one of my new all-time favorite dinners! 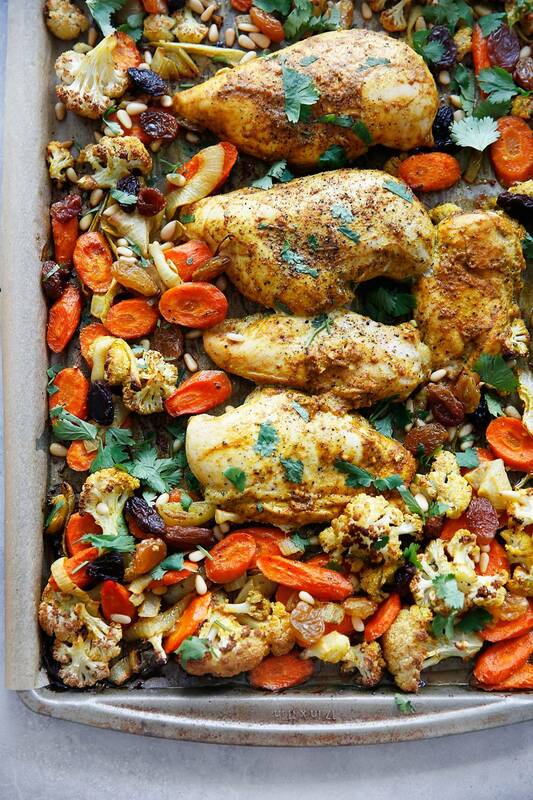 The crunch of pine nuts, the touch of sweetness from the raisins, plus perfectly cooked veggies and chicken loaded with curry spice makes it a delicious sheet pan dinner that will impress anyone! Why make dinner on a sheet pan? 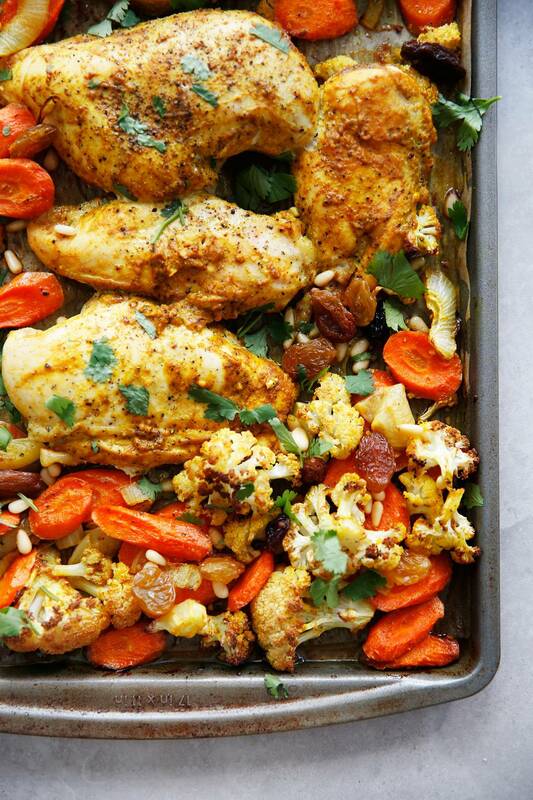 We love sheet pan recipes for so many reasons! 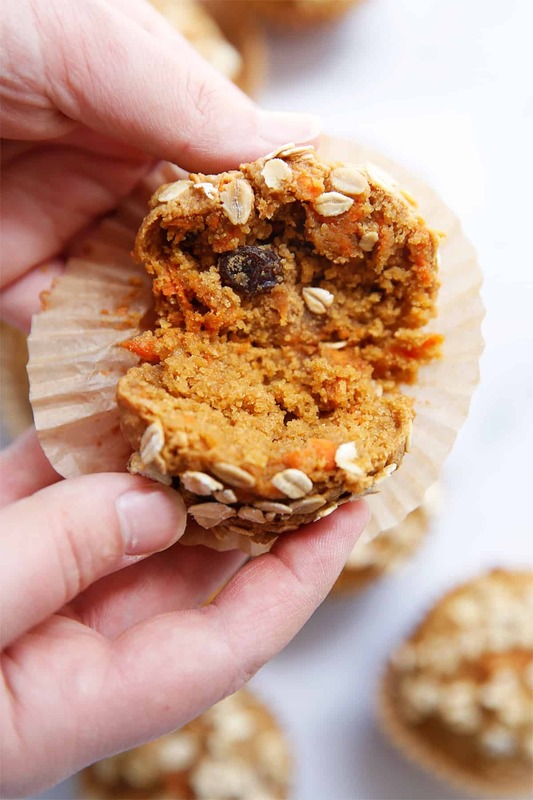 They are simple to prepare, do not require hands on cooking time and are packed with flavor! 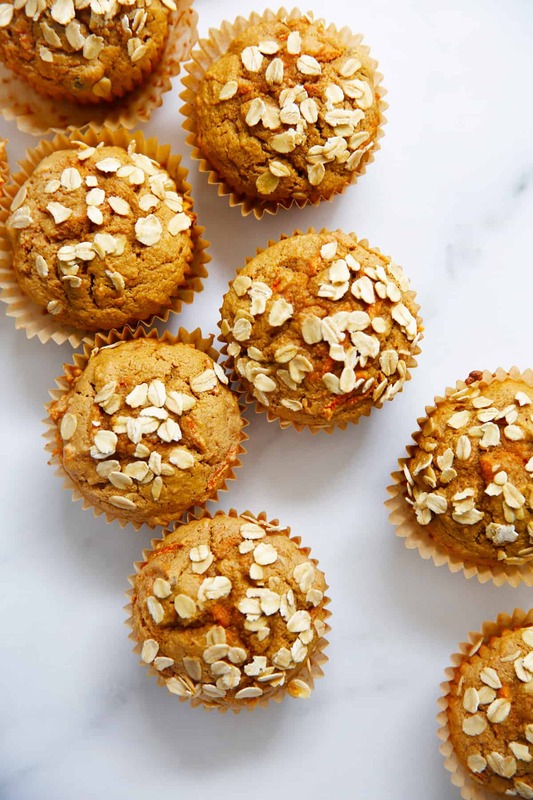 Yes, there are a few steps to follow in these recipes, but aside from mixing a few ingredients together or chopping a few vegetables, the cooking process is mostly hands-off! This means that while dinner is baking in the oven, you can get ahead on some household chores or spend some times with the family instead of standing over the stove babysitting a recipe. Check out the tips below to make sheet pan cooking a breeze. P.S. I am so excited that my favorite chicken company, Shenandoah Valley Organic, is the chicken you get in your ButcherBox! It makes my heart happy to see two companies really doing the right thing coming together. I always stock my ButcherBox with the SVO chicken tenders, thighs, and breasts! What is ButcherBox? Each month, they curate a one-of-a-kind selection of the healthiest, tastiest meats, humanely raised and free of antibiotics and hormones. Or you can customize your box and select your favorite cuts and get 20% more meat.The price works out to less than $6.00/meal and shipping is always free. You can also space it out so it’s not every 4 weeks, too! ButcherBox delivers your meat for the month, saves you money, and is the best quality! Order Today and get this amazing deal! 4 medium carrots, diced to 1/2"
Pre-heat oven to 400ºF and line a rimmed 12" x 18" sheet pan with parchment paper. In a small bowl, mix curry powder, cumin, garlic powder, salt, pepper, cinnamon, and cayenne (if using) to combine. In a large bowl add sliced onions, garlic, cauliflower florets, carrots, 2 tablespoons avocado oil and 1/2 of spice mixture. 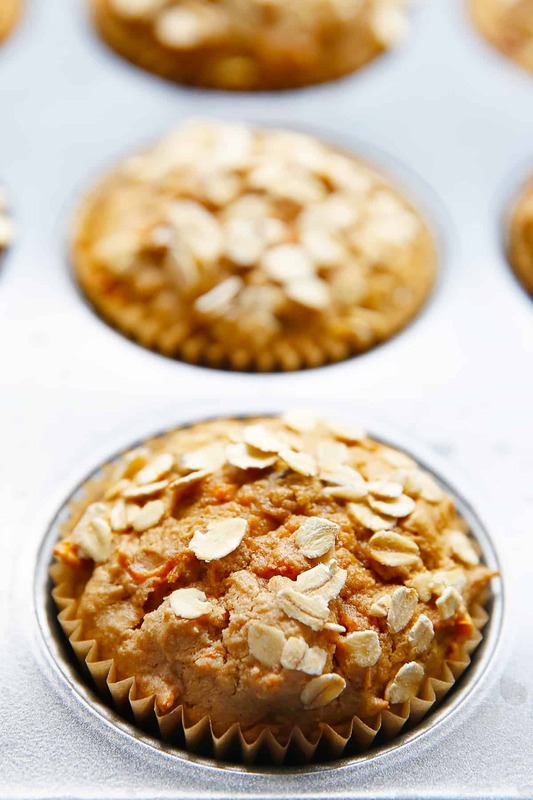 Mix to combine and spread on to rimmed baking sheet. Meanwhile place chicken breasts into the large bowl. Add remaining 1 tablespoons avocado oil, remaining curry spice mixture and lemon juice. Toss to combine and place in refrigerator to marinate while vegetables are baking. 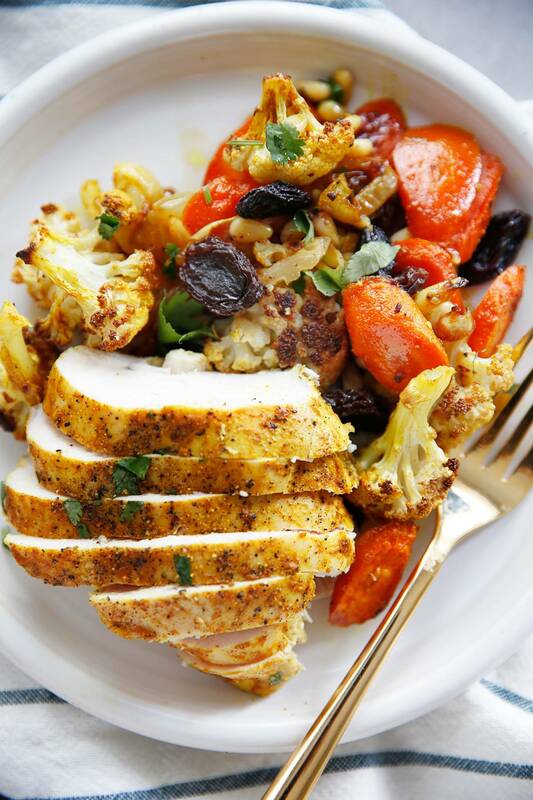 Take out sheet pan after 20 minutes, and move vegetables to the edges of the pan to make space for the chicken. Place the chicken breasts in the middle of the pan and pour over any reserved marinade. Continue to bake for 20-25 minutes, or until chicken is fully cooked through. Remove from oven and sprinkle with pine nuts and raisins. Serve warm with lemon wedges and cilantro. You could alternatively use boneless, skinless chicken thighs.